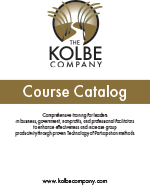 The Kolbe Company and Sacramento Professional Facilitators are national leaders in providing professional leadership and facilitation training. Whether you are beginning your journey as a meeting leader or looking to become a professional facilitator, we have courses to meet your needs. Just click on the links below to get more detailed information about each course.